DreamCalc provides a range of accessibility features to assist with impairment. The "rugged" variant is shown right. For example, click Mode→Keypad Voice→Calculator to Speak, or go to the "Accessibility" page on the Options Windows. With this option is selected, voice feedback will be generated whenever a key is pressed. Where possible, DreamCalc will generate correct and natural pronunciation of mathematical formula and numbers above and beyond what an external narrator would deliver. For example, it will correctly pronounce unit conversions, constants and function names such as "sin", "sinh" and "tanh" etc. Furthermore, the number 1.5E21, for example, will be read out as, "1.5 times ten to the 21," rather than "1.5 ee 21.". IMPORTANT: DreamCalc will speak in the English language only, and an English language voice must be installed on your system for it to function properly. With this option selected, DreamCalc will speak only the final result shown when the [ENTER] key is pressed. By default, when speaking a number, DreamCalc will not read out all digits after the decimal place, but will round up to a few decimal places. For example, the number PI will be rounded and read out as, "three point one four," even though more digits may be shown in the display. This is intended to avoid verbose and potentially unuseful voice output. You can change this setting from the "Accessibility" page in the Options Window. If you wish, it can be disabled so that the entire number is read out by setting spoken precision to "Speak Full Number". The following voice features can be used independently of the keypad voice setting. 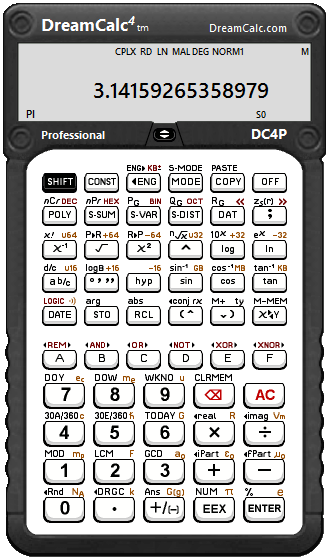 Irrespetive of the keypad voice setting, you can have DreamCalc read out the display value at any time by clicking on Edit→Speak Result from the main menu. For convenience, this feature can also be used from the keypad itself (look for the shifted [] function key). It is also possible to have the Paper Roll & Register Window speak the entire last input expression, irrespective of the calculator's voice setting. Clicking on Edit→Speak Last Input (or the  button) in the paper roll window will cause DreamCalc to speak the last input expression. Right-clicking on a calculator key in the main interface will normally show a help hint describing the key's function. From the accessibility page in the Options Window, you can configure DreamCalc to speak these help hints also. Note that this feature can be used irrespestive of whether the calculator is set to speak in use or not. DreamCalc supports a comprehensive range of input keystrokes (for example, you press "S" rather than typing out "s-i-n"). Additionally, you can toggle the keypad focus mode by pressing TAB. In this mode, the key with input focus is surrounded by dotted rectangle, as shown below. Press RETURN to activate the focused key. Press "H" to show the key help hint (this is the same as right-clicking on the key). DreamCalc's key focus behavior is similar to that of standard Windows input controls, however you should use the arrow keys to move input focus rather than TAB. You can also use the HOME and END keys to jump to the top and bottom of the keypad respectively, and PAGE UP and PAGE DOWN to skip multiple rows. In key focus mode, keystrokes other than RETURN and the arrow keys, work as normal. Press TAB again to leave the key focus mode.